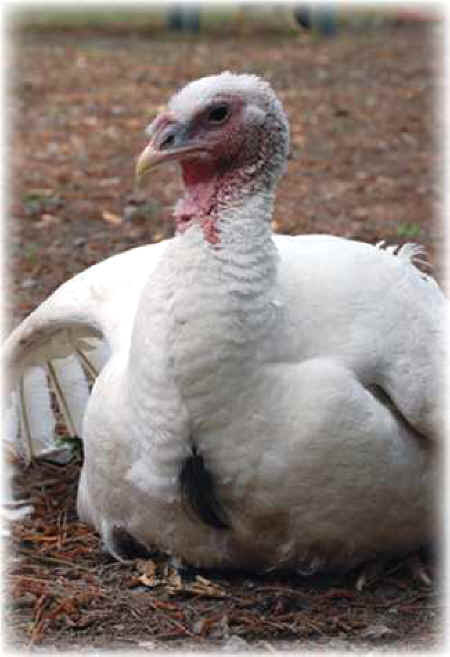 UPC adopted Amelia as a young turkey in the fall of 2007. A local farmer gave her up as "too expensive" to keep. She hangs out with the chickens, sits with them under the trees in the afternoon sunlight, and when people visit, Amelia fans out her snow white tail feathers, just like a male turkey, and joins the visitors in a stroll through the sanctuary yard, never leaving their side. During the past two summers, Amelia has chosen a leafy nesting place to quietly lay her eggs. At night she stays outside with the ducks until the very last minute, but when I call her, "Come on, Amelia, time for bed," she slowly makes her way into her house, following her duck friends, for the night. Amelia's legs began giving her trouble and then they went out altogether. She lost her mobility and will to live. She died peacefully at UPC's sanctuary in March 2011.